At a reading of poets in support of human rights, held at the Seattle Public Library just before last fall’s presidential election, I found myself standing by the book sales table, talking with Anna Bálint—poet, novelist, teacher of writing, and literary activist—with whom I had chatted on several previous literary occasions but never spoken with in any depth. This time, though—perhaps energized by our mixed excitement, and apprehension, about November 8; perhaps anticipating the impending electoral debacle—we lingered, talking about our own struggles and successes in integrating social activism with our writing life: how each endeavor supports and feed the other, even if they seem at times to compete. Anna told me how, a few years earlier—downhearted by a few family struggles and discouraged by the infamous Seattle chill that sometimes shivers even into the local literary scene—she had become involved with Seattle’s Recovery Café. This urban center, as Bálint calls it, is “a home base of sorts…where many different needs are met under one drug- and alcohol-free roof”—a place where people in recovery can get involved in a wide array of activities and partake of key services. Invited there by a friend to have lunch in the Café, Bálint met staff and members of the community whom the Recovery Café serves, and was soon planning a class for the School of Recovery at the Café—a class called “Writing the Stories We Never Knew Were Ours,” similar to those she had offered at Antioch University and Richard Hugo House. This course soon evolved into the Safe Place, which Bálint has directed since 2012 at the Recovery Café. Every Friday, people struggling with addiction, mental illness, trauma, and homelessness come together in the Safe Place Writing Circle to write and share writing. Here they discover their own unique voices and ways of shaping language to write stories and poems as part of reclaiming their lives. The Safe Place combines structure with encouragement and moral support, writing prompts and opportunities for self-exploration of personal and family histories, enabling participants to reconnect with their essential selves as they write about life experiences and the lessons they have learned along the way. The Safe Place became a family within the larger welcoming community of the Recovery Café, where members encounter and sustain the magic of sharing with and inspiring others. 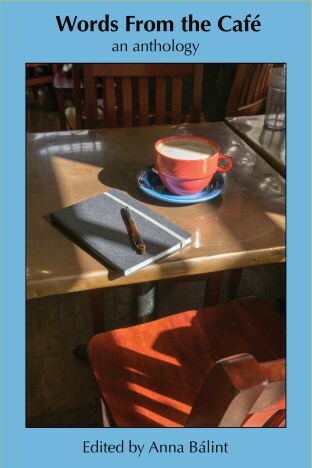 After our conversation, I had the opportunity to read the recently published Words from the Café: an Anthology (2016), an outgrowth of this writing circle magic, published by Raven Chronicles Press as a means of sharing the unique voices of Safe Place writers. Bálint has undertaken courageous service in her editorship of this anthology of work by participants in the Safe Place, who seek human community while trying “to get back, or return, what was lost” in their lives—as Donald, one class participant, put it. With an insightful and empathetic introduction by Bálint, the anthology showcases poetry and prose by ten Featured Writers, those who have been most active for 2–4 years in the writing circle; and a poem or prose piece or two by a dozen Other Voices. The contribution of each Featured Writer is preceded by a black-and-white headshot by photographer Willie Pugh, and a biographical portrait written by Bálint—bios and photos which give us readers a sense of each writer’s history and background, touching in diplomatic manner on the issues which have brought each of them in the first place to the Recovery Café. Some of the pieces included here appeared first in Raven Chronicles, the original nurturing ground for this project. This anthology, in fact, is Raven Chronicles Press’s first venture into book publication. Particularly moving are the memoir narratives of Seattle native Donald W. Butler—one-time break dancer and performer whose teenaged struggles with addiction led him to prison, where he read extensively and embarked on the road to recovery and the Safe Place; the poems and flash prose of Tamar Hirsch, born in Israel to Holocaust survivors with the “Holocaust cloud hovering over the family,” a grim ambience that exacerbated health problems in her teens and young adulthood, before she found her way back to university classes and the Safe Place; the accounts of poet Bang Nguyen, son of Vietnam War refugees and college graduate whose successful career in finance took a detour after he grew disillusioned and “fell off the corporate ladder” into addiction, and whose recovery led him to become an advocate for affordable housing and an end to homelessness. Other featured Safe Place writers include Spokane native Angel Ybarra, who has created vivid portraits of her mother—a glamorous but volatile former performer in Broadway-style shows—whose living-room dance binges alternated with heavy drinking and helped precipitate her daughter’s slide into addiction, blackouts, and finally jail time, until Ybarra found her way to AA and the Safe Place. And there is singer-songwriter Megan McInnis, whose writing features lively reminiscences of her large, loving family—especially of her resourceful mother who scrimped, saved, and optimized her use of food banks and other strands of the social safety net after her husband left—and McInnis’s own strivings against OCD and other addictive behaviors, and whose ventures into yoga and Eastern meditation as a devout atheist read like a Recovery Café stand-up routine on the page. Happily, we readers don’t merely have to imagine the sounds of these voices: Words from the Café includes a CD, with a playlist insert, of the ten Featured Writers reading selections from their work published in these pages. All the contributors published here have compelling and dramatic stories to tell, and thanks to Anna Bálint’s Safe Place Writing Circle, her compassionate direction and encouragement, and participants’ support of and inspiration for each other, they have created, within their journeys of recovery, a space for the magic of self-discovery and transformation. As Bálint has said, we need to value the lives of people with whom we have more in common than we may realize—we all have the capacity to lose ourselves, and to transform ourselves as well. I am looking forward to future readings by Safe Place participants at readings sponsored by Raven Chronicles, and to visiting the Recovery Café and its circle of writers. Carolyne Wright co-edited the ground-breaking anthology, Raising Lilly Ledbetter: Women Poets Occupy the Workspace (Lost Horse Press, 2015), which received ten Pushcart Prize nominations and was a finalist in the Foreword Review’s Book of the Year Awards. She has nine earlier poetry volumes, five books of poetry in translation from Spanish and Bengali, and a collection of essays; and has received NEA, 4Culture, and Seattle Office of Arts & Culture fellowships. Wright lived in Chile and traveled in Brazil on a Fulbright Grant during the presidency of Salvador Allende; and spent four years on fellowships in India and Bangladesh, translating Bengali women poets. After serving as visiting poet and writer at colleges and universities around the U.S., she returned to her native Seattle in 2005, and since then has taught for Richard Hugo House, the Whidbey Writers Workshop MFA Program, the Antioch University Los Angeles MFA Program, and for national and international literary conferences and festivals. Besides writing, teaching, and literary, social, and environmental activism, Wright has been gaining fluency in Brazilian Portuguese in preparation for a return visit to Bahia on an Instituto Sacatar residency fellowship in 2018. She first published poems in Poetry Northwest in the 1970s.